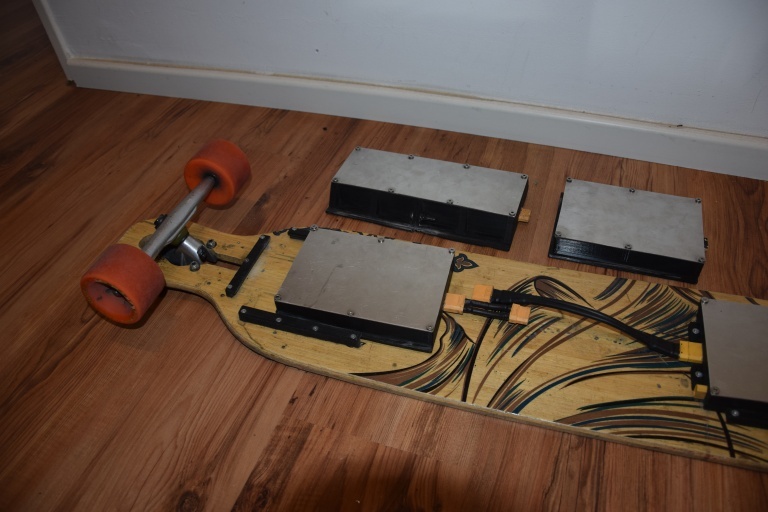 Introduction for building an DIY electric skateboard / DIY electric Longboard by Nicolas Nostheide. 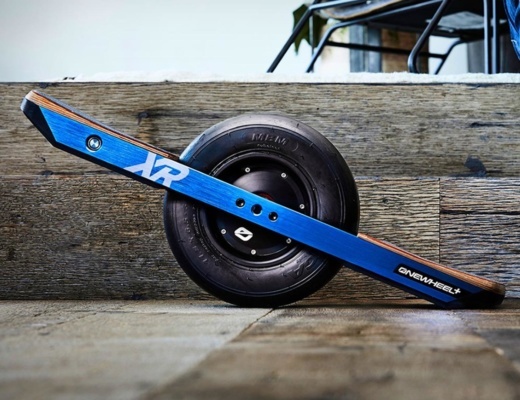 This article is addressed to all readers which are interested in building an DIY electric skateboard, but also for all people which just want to know how an electric skateboard basically works. For the sake of simplicity I wouldn’t like to go into detail too much but you should have a basic knowledge about electronics. I want to emphasize once more that electric skateboards are not toys. Especially the handling with electronics can be very dangerous. First of all the battery pack has to connect to the ESC. This will power up the ESC and the receiver for the remote control. If the throttle gets triggered, the remote control sends a signal to the receiver. The receiver converts the signal into a pwm signal whose pulse width controls the rotational speed of the motor. This pwm signal is observed by the ESC which generates DC pulses on three wires from the DC current of the battery in order to let the motor rotate. The ESC is the brain of the whole electric circuit and an import component in order to build an DIY electric skateboard. The ESC generates DC Pulses from the DC battery which let the motor rotates. 6 MOSFETs (3 H-bridges): The three motor wires can be connected to the plus pol and the minus pol of the battery independently. A h-bridge consists of two mosfets which must not connect through a the same time. Otherwise the batterie is shorted. This means that there are 6 possible combinations (phases) illustrated in the image below. If the phases sequence is in the right order the rotor will begin to rotate. Rotor position monitoring: This circuit detect the rotor position by measuring the inducted voltages on the tree motor wire. Microcontroller: The microcontroller generates 6 phases and switch the MOSFETs. The voltage level of the µc are too low in order to switch the MOSFETs directly. Therefore so-called MOSFET-drivers are used to increase the voltage level. The rotational speed is controlled by the switching frequency of the MOSFETs and the torque resp. the current is controlled by a pulse width modulation of the single phases. BEC: Power supply for other circuits. Capacitor: Connected parallel to the battery in order provide energy in case of current peaks. 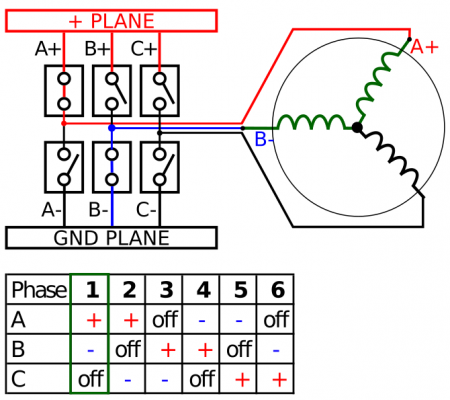 As mentioned before the Mosfets have to switch 6 phases in order to let the motor rotate. This illustration shows the Y-connection of the stator windings. The image shows state of phase 1. Here you can see that one wire is connected to the plus pol of the battery via A and an other wire to the minus pol via B. The third wire is not connected. Current: the current which can be provided by the ESC continuously without blowing the ESC. Current loses of the mosfets during the switching moment lead to generation of heat which has to be cooled down. Therefore heatsinks are usually a large part of the ESC. Keep in mind to avoid covering them. Battery voltage: The battery indicate the max voltage which the ESC can handle. This voltage is usually provided in S (number of cells). For example: 6S equals to 25.2V. If an ESC can handle mor than 6S the ESC is often labeled as HV ESC (High Voltage). These kinds of ESCs are usually more expensive. BEC: The Battery Eliminator Circuit is a circuit within the ESC and generates a voltage which can be used for external modules like the remote control receiver module. In modern ESCs the voltage can be adjusted by programming the ESC. API: Many ESCs have an API (application programming interface) in order to adjust several parameters like the BEC-voltage, the brake, switching frequency of the MOSFETs etc. 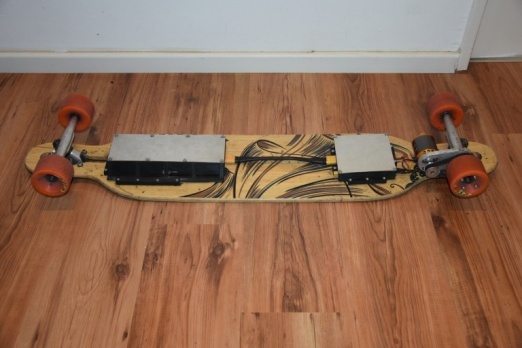 The heart of the DIY electrical skateboard is the motor. The motors are commonly so-called brushless motors (BLDC Brushless Direct Current). There are two types of brushless motors for a DIY electric longboard project. Inrunner and Outrunner whereby the outrunners are most commonly used because the can generate a higher torque due to outer rotation of the rotor. Both kinds of brushless motors are available with an additional hall sensor which can determine the exact position of the rotor. This can be used to implement a very smooth start. In this article we will focus on outrunner. Label: z.B. 5065/06. Diameter of 50mm. Length of 65mm without shaft. 06 is the number of windings. If there are more windings the torque increases but the rotational speed of the DIY electric longboard decreased. The torque is also proportional to the diameter of the motor. A common size with high torque is 6374. KV: The KV-value gives the number of revolutions in a minute at 1 Volt. For example: The battery voltage is 30V and the motor has KV270. The max rotational speed is 30*270 = 8100 RPM. If the gear ration and the perimeter of the wheel are included into the formular the theoretical max speed can be calculated. The KV-value affects besides the maximal rotational speed the torque. If the KV-value is high, the torque is low and vise versa. Therefore the KV-value should be chosen advisedly. How to chose the right KV-value will be explained in another article. Recommended voltage: for example: 8S. At 8 cells the voltage is about 30 volt. Max power: 2000W. With the help of the recommended voltage the max current can be calculated: 2000W/30V = 66,6A. The max current shout not be exceeded or just for short moment. Otherwise the copper wires get hot and isolation coating starts to melt. This leads to a short and the motor blow. In this case the motor is out of control and and sudden brakes can be happened. In other words: the worst case for the rider! The receiver is small box driven by the BEC. It receives the signal of the remote control of the DIY electric longboard and passes it the the ESC as pwm signal. The duty cycle controls the speed. The remote control sends the signal to the receiver in order to control the speed. If the rider pulls the throttle the speed is going to increase. 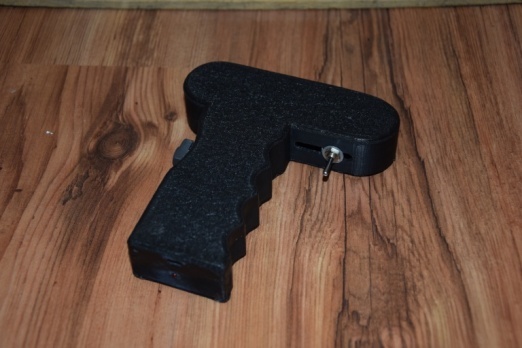 The remote control can be purchased online many RC online shops. The batteries for a DIY electric skateboard uses the lithium-polymer (LiPo) and the Lithium-Ion (Liion) technology. Both technologies uses cells which have a nominal voltage of 3.6V. In order to get a higher voltage multiple cells can be connected in series. For example: a 6S battery has a nominal voltage of 21.6V. 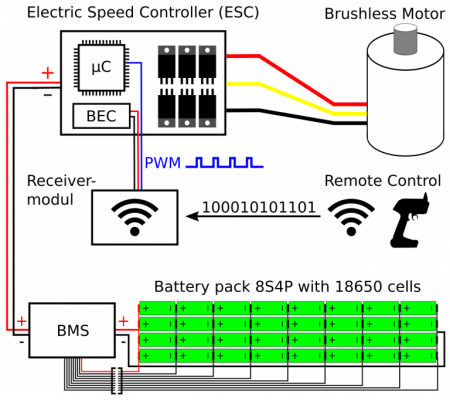 In order to increase the capacity of the DIY electric longboard, multiple cells can be connected parallel. A 3S2P battery has 3 cells in series which each are 2 cells in parallel. 6 cells in total. + 18650 cells can be configured arbitrary. Capacity: The capacity is measured in mAh which means how much current ca be provided by the cell for one hour. The parameter is actually not meaningful unless the nominal voltage is given as well. The nominal voltage times the capacity yields the amount of energy measured in Wh. Example: 10S4P with 2600mAh cells: (10*3,6V) * (4*2600mA) = 374Wh. Discharge rate C: The discharge rate provide information how much current ca be drawn out of the battery constantly. Just multiply the C rate with the capacity and you will get the maximal discharge current.A batterie with 5000mA and 20C can be discharged with max. 100A. The C burst parameter is the current which can handled by the battery for a short moment. Charge rate: The charge rate works like the discharge rate. It is usually smaller than the discharge rate. End-of-charge voltage: top voltage level for one cell. The cell will be damaged if the cell will be charged above this threshold voltage. It can also lead to an explosion. End-of-discharge voltage: LiPo and Liion cells must not exeed this lower threshold voltage because they get damaged otherwise. A BMS is usually used to prevent a battery of over discharging. The gear of a DIY electric skateboard consists of four parts. Motor mount: The motor mount can be bought in several online shops for electric skateboards or you can build your own. You can easily get a piece of aluminium from you local DIY market (120mm (length) x 50mm (motor diameter) x 10mm (thickness)). This will cost a few bucks and you will get it immediately. The remaining part is a lot of handiwork depends on your collection of tools. The important part is that the motor can be adjusted in order to tension the belt. This can also be important because you are not bounded to a specific motor pulley. An other important thing is that the mount ca be adjusted in the rotation around the skateboard axis. Otherwise the clearance between the motor and ground is fixed and cannot be adjusted. Belt: The belt should be HTD 5M like the two pulleys. This parameter indicates the profile of the tooth. 5M is the distance between the teeth. A belt with 50 teeth has a perimeter of 250 mm. Most commonly used belt lengths are 250-300mm. The widths of often used belts are 9mm, 12mm, 15mm. The pulleys should have the same width. If the width of the belts gets wider the more torque can be transferred to the wheel without having any teeth skipped. For a DIY electric longboard with two motor system a belt with of 9mm is sufficient. With a single motor setup go for 15mm belt. Pulleys: The ratio affects the torque and the max speed. A small motor pulley leads to a higher torque but to lower max speed. By increasing the motor pulley the opposite can be achieved. A small wheel pulley leads to higher speed but the torque will be decreased. So there is a sweet spot between speed and torque. Recommendation: Dimension the gear for a max speed you want(covered in another article). Otherwise you will have a top speed with your DIY electric longboard which is probably way above the speed which can handled safely. In this case you will lose potential torque.